Crab rangoon is a fave comfort food of foodies! We took that comfort food love and created crab rangoon egg rolls. They were a hit — a VIRAL hit! And we got a tad bit adventurous and whipped up some Crab Rangoon Taquitos with Raspberry Salsa. 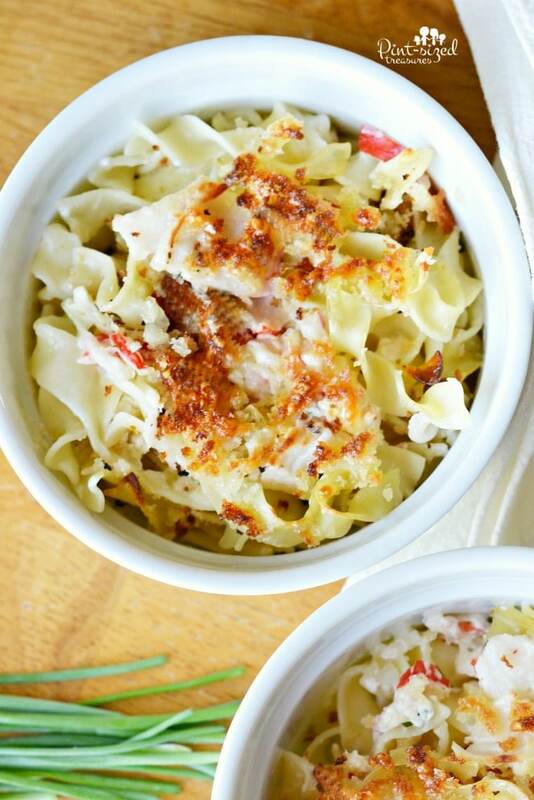 So we got a little bit crazier and created — wait for it — Cheesy Crab Rangoon Casserole. 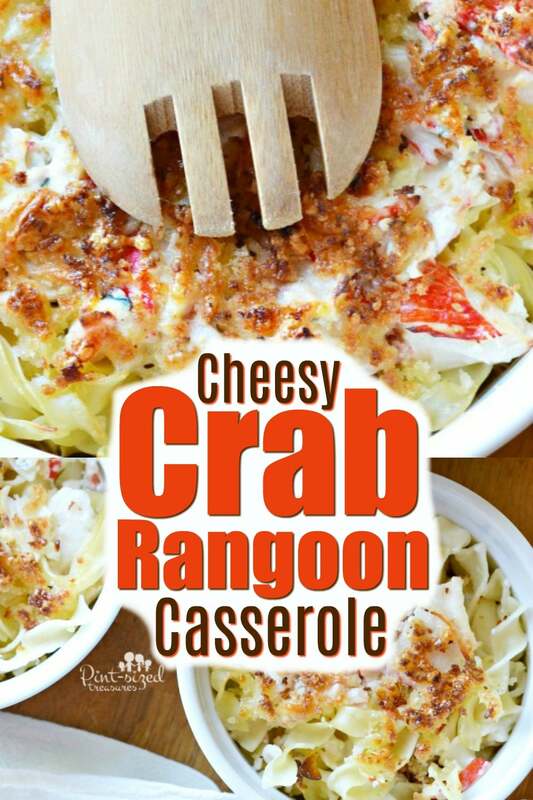 This recipe is packed with fresh ingredients so you feel good when dig into this cheesy, hearty, crab rangoon lover’s casserole! Don’t worry — we added the fresh green onions that true crab rangoon fans crave! Make sure you cook them up smooth, firm and fluffy! Cook your noodles just long enough so they don’t get mushy in the casserole! 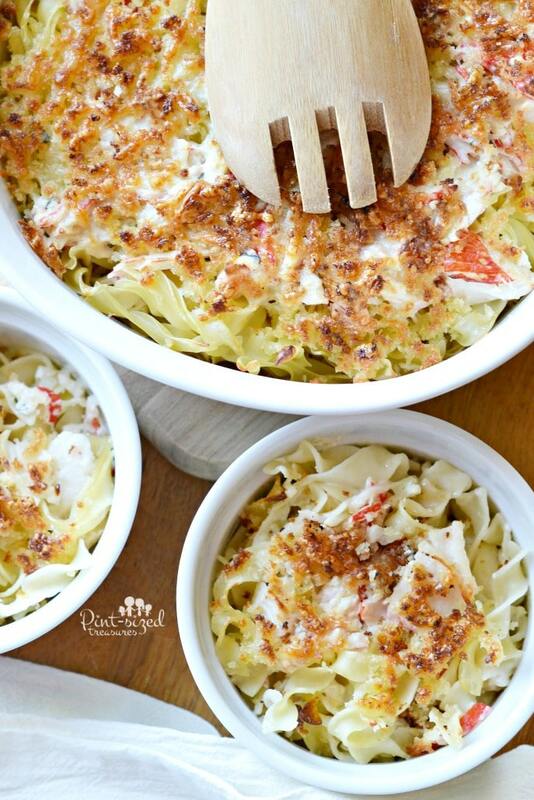 Casseroles are just what busy families need — it’s comfort food you can rely on!We used broad noodes in this cheesy, crab rangoon casserole dish. Here’s a super busy family hint for this recipe: if you’re in a crazy BIG hurry, you can change up this dish to fit your time-saving meal needs. Skip baking. 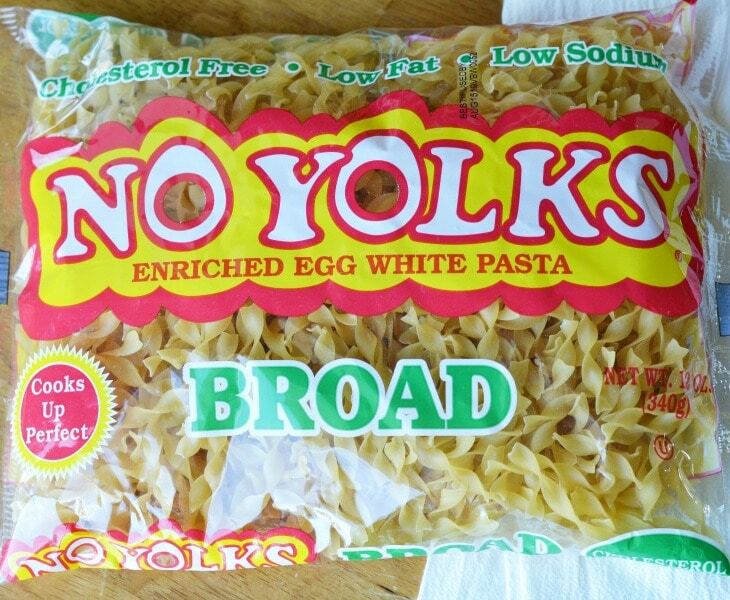 Toss all ingredients into a skillet and combine with cooked, No Yolks noodles. Heat and stir until everything is warm and bubbly. Serve! Skip the topping. Just cook on your stove and skip the topping. Because a baked casserole with a crunchy topping is the KING of ultimate comfort foods! 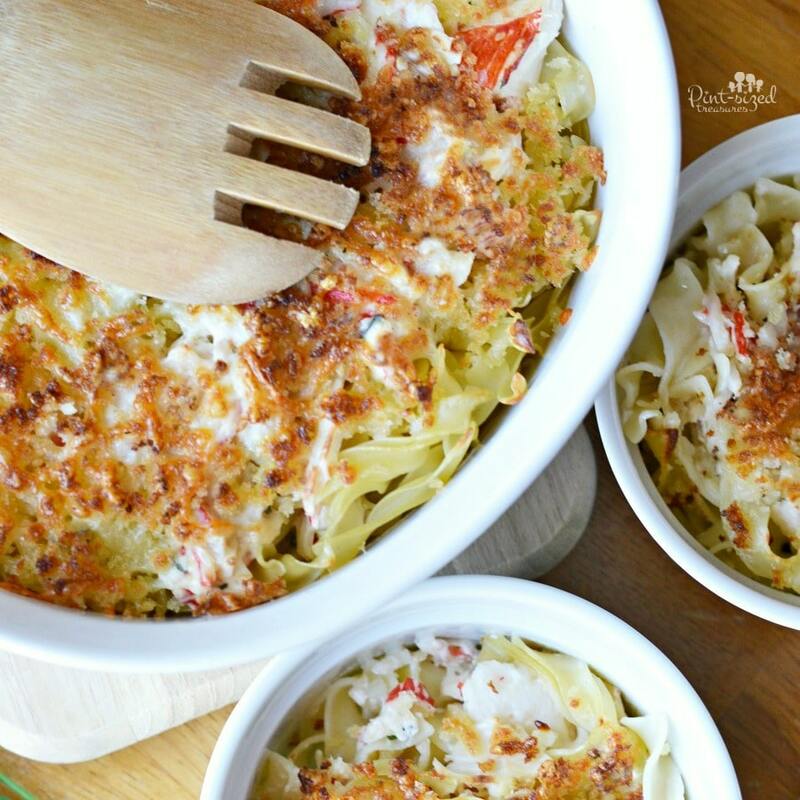 But, the above time-saving tips will still give you a cheesy, hearty and super yummy recipe that noodle and crab lovers crave! 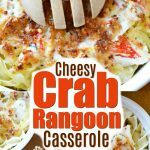 This easy, crab rangoon casserole is incredibly cheesy and packed with crab and all the flavors that crab rangoon fans love! Mix all filling ingredients together until incorporated. To make the sauce, melt butter in a medium saucepan over low heat. Add flour and cook for a minute or two. Slowly stirring constantly add milk. Keep stirring until sauce thickens. Place noodles in a 9x13 baking pan. Spread cream cheee mixture over noodles. Then pour sauce on top. Add an additional layer of noodles, then the cream cheese mixture and pour the sauce over that layer. Cover with foil and bake in a 350* oven for 30 minutes. 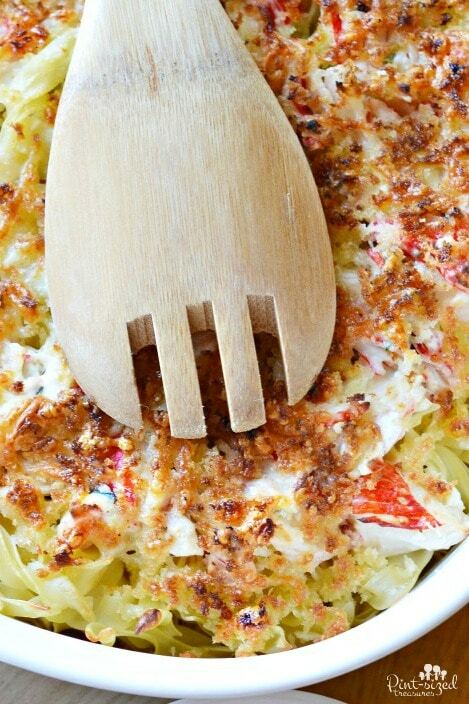 While casserole is baking, combine parmesan cheese, panko crumbs, and butter in a small bowl. Remove foil and sprinkle with topping. Place casserole under broiler for 2-3 minutes or until golden brown.